The Pew Research centre conducted a poll in mid-February asking respondents what aspects of federal spending they would prefer to see cut. The poll confirms past surveys that show that although Americans prefer to cut government spending in abstract terms, there aren’t many specifics they want slashed. 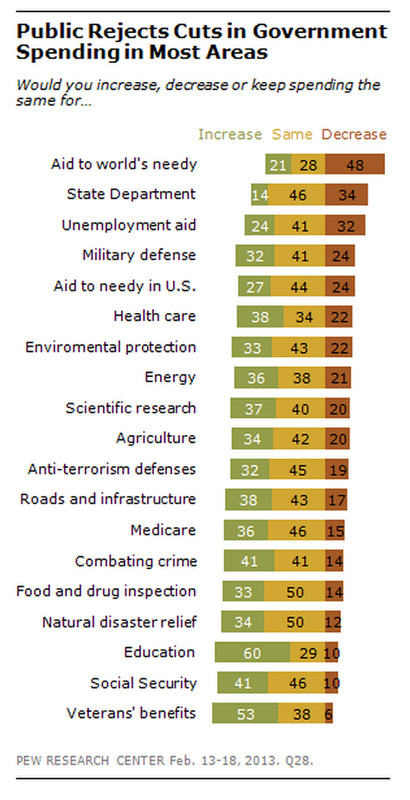 The poll comes as the cuts known as the sequester begin to start kicking in this week. Under sequestration, every non-exempt aspect of government spending will see a cut. This will generate $1.2 trillion worth of savings over the next 10 years. But the Pew poll found that respondents were relatively content with the size and scope of most aspects of the government, despite a general urge to cut spending in broad terms. As the chart shows, the only aspect of government spending respondents wanted cut was foreign aid. Still, USAID is a relatively small portion of the grand federal budget, accounting for a total of only $50.7 billion in fiscal year 2012. The least controversial portions of government spending were Social Security, veterans’ benefits, and education. The latter two are both subject to cuts as a result of the sequester, but only one-tenth of respondents wanted them to be slashed.